Shelby's hair is her own. Sure, there are times that I want to take a curling iron to it and just go bananas. But that would be like trying to bathe a cat. Trust me...it's not worth it. So, I have submitted. It gets washed every other day. It gets combed after the bath. But what happens after that is a mystery. She goes to sleep and while she is sleeping she either rubs her head into an electric socket, or a family of mice takes up residence. Because each morning she wakes up with it fluffier and scragglier than the day before. Once in a while she will let me "style" it, which means I have ten seconds to get it in to a ponytail before she changes her mind. 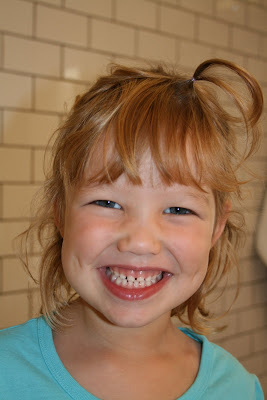 And often, she wants to add a little finishing touch, that makes it all her own, like say, every bobby pin that I own. Or today, it would be this tiny second pony tail crafted from a strand of her bangs. Oh, the creative genius. 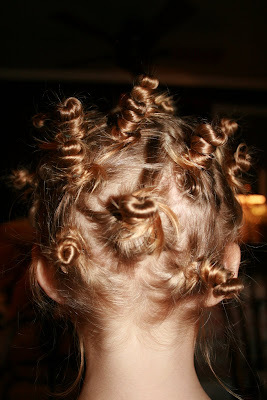 Don't say I didn't warn you when all your kids start begging for this hair style. 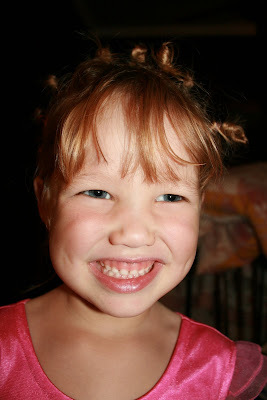 One day, she did ask me to make her hair curly, which meant that she wanted me to make little buns all over her head (like she had seen me do to my own head a few weeks earlier) so that when she woke up she would have curls. 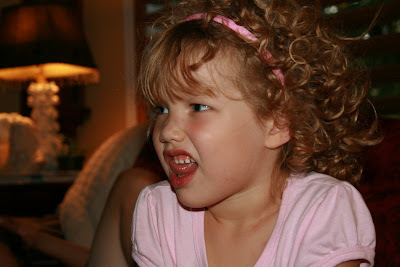 Ta Dah!...Shelby with curls. She said that she didn't really like them. I think that it's because she looked like Micheal Jackson from the Jackson 5 days, before it loosened through out the day. 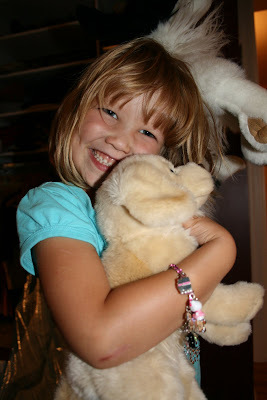 But a few days later she was back to her old self, sporting stuffed animals as hair pieces..as happy as could be. I must admit that there are days that I wish that I could stick a stuffed animal in my rat's nest and feel as confident as she does. Love her.